« Where to Watch the Jets-Patriots Game This Sunday — It’s Playoff Time! 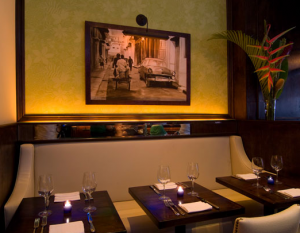 Yerba Buena: Escape the cold to Yerba Buena for the feel and taste of Cuba, where Chef Julian Medina takes Latin cuisine to the next level. Enjoy the special dinner menu with first course choices including ceviche chifa, tacos de pescado, and arepa peluda. Entrée choices such as tallarin verde con pollo, sea bass chorillana or entrana will kick the heat up even more. Finish with traditional sweet endings including flan de coco and pastelito de chocolate. 10 Downing Food & Wine: Chef Jonnatan Levia brilliantly fuses American and Mediterranean cuisine and has created enticing Restaurant Week menus for lunch and dinner. People watch through 10 Downing’s large open windows while enjoying your choice of potato-leek soup or spinach and pear salad; smoked salmon omelet, roasted chicken sandwich, or grilled flank steak salad; and burnt caramel coconut flan. Red Rooster Harlem: Indulge in some comfort food for dinner at Manhattan’s newest uptown restaurant, Red Rooster, named after the legendary Harlem speakeasy, under the direction of acclaimed Chef Marcus Samuelsson. Start with either the red Caesar salad with bottarga; or split pea, pumpkin and wurst soup before moving on to a main course of seared salmon or ripped pork. Enjoy a classic red velvet cake or black and white cookie for dessert. Be sure to try one of their infused bourbon cocktails. 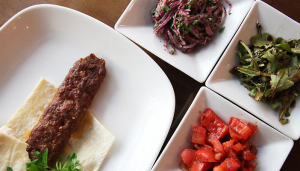 Pera Mediterranean Brasserie: Sit back for lunch or dinner in this modern brasserie and enjoy a trip to the shores of the Mediterranean courtesy of Turkish Chef Sezai Celikbas and American Chef Jason Avery. Appetizer selections include a soup du jour, Pera’s dip duo, Portuguese fried calamari, Maroul salad, and lamb chop shish (lunch only). Entrée choices include fresh lamb adana, chicken brochette, Pera steak frites (dinner only), seared sea scallops (dinner only), mushroom pappardelle, and Mediterranean fish and chips (lunch only). Choose from baklava and traditional Turkish vanilla rice pudding for dessert. The Oak Room at the Plaza Hotel: Introduce some old school New York elegance into your Restaurant Week lunch or dinner plans with a visit to the landmark Oak Room, located inside the recently upgraded Plaza Hotel. The lavish three-course menu offers appetizers including lobster and sweet corn bisque, tomato and fennel soup, buttermilk Bibb salad, tempura calamari (lunch only), and bigeye tuna sashimi (dinner only). Follow these with a choice of chicken or shrimp Caesar salad (lunch), Oak Room chopped chicken salad (lunch), spaghetti, pan-seared wild salmon (lunch), crisp organic brick chicken (dinner), and grilled Meyer ranch hanger steak. And, then, choose from some of the storied Oak Room’s dessert favorites including the Oak Bar, raspberry cheesecake, and mini ice cream cones. Toloache: If Julian Medina’s Yerba Buena menu ignites a craving for more of his fabulous cooking, head West to lively Toloache with its authentic Mexican design and cuisine. Sizzle up your night with appetizers including sopa de castanas, ensalada de espinaca, and tacos de puerco. Entrée choices include pollo con mole coloradito, enchiladas de carnitas (lunch only), pescado sarandeado, and sabana con siete chiles (dinner only). Finish with a cooling dessert of flan de coco or pastelito de chocolate. 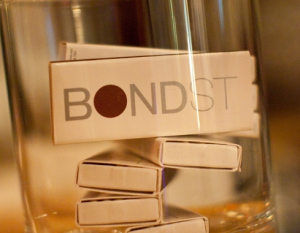 Bond St: Enter the cool of this sleek Japanese restaurant for a Restaurant Week dinner and you’ll see why it remains a celebrity hot spot. Start with tofu miso soup or a mixed green salad before tucking into a Bento plate with a choice of spicy crispy shrimp, age dashi tofu or steamed yuba dumpling; a salmon avocado roll, spicy tuna roll, or sashimi selections of tuna, yellowtail and salmon; an entrée choice of broiled sea bass or New York strip steak; and dessert selection of coconut tiramisu, chocolate meltdown or a ricotta cup. DBGB Kitchen & Bar: Chef Daniel Boulud adorns the mirrors of his downtown brasserie with his favorite culinary quotes and his menu with his favorite comfort foods. For lunch, enjoy butter, lettuce and chive salad; winter squash soup; or pâté campagnard to start, followed by risotto, steamed Prince Edward Island mussels or a Yankee burger. The three-course special culminates with a gâteau tout chocolat or a green apple-honey sundae. *American Express cardholders will also get a $15 dining credit back on their statement when registering their card and using it to dine out three or more times at any participating restaurants during NYC Restaurant Week. This entry was posted on Monday, January 24th, 2011 at 12:00 am	and is filed under Stuff to Do. You can follow any responses to this entry through the RSS 2.0 feed. You can leave a response, or trackback from your own site.